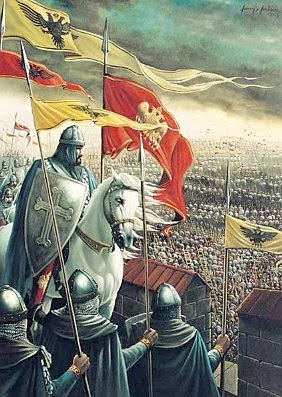 Five hundred and fifty-seven years ago today the city of Constantinople fell to the Ottoman Empire, and the Byzantine Empire came to an end. The sack of Constantinople inaugurated centuries of brutal Islamic rule in southeastern Europe. Greece was finally liberated from the Ottomans in the 19th century, but to this day a small portion of Europe remains in Turkish hands, and the city of Istanbul — formerly Constantinople — remains a Turkish city. I am half-Greek, and I wrote this as a memorial to those who fought in the epic battle against Islamic expansionism. I wrote it also as a memorial to the other Christians in the Balkans who lost so much to Islam. I have spent time in Istanbul, and I bear no hatred towards the modern Turks. On June 9th, 1453, three ships sailed into the harbor of Candia in Crete with a crew of mostly Cretan sailors. The sailors had arrived from Constantinople shortly after its fall to the Ottoman Turkish armies of Sultan Mehmet Bey. The Cretans had brought with them the tragic news about the fall of Constantinople to the armies of Islam, despite a heroic stand by the Greeks and their allies. The sudden news induced great anguish amongst the people of Crete and later the Christian west. The Ottoman conquest of the queen of cities had brought a tragic end to the Roman Empire, often referred to as the Byzantine Empire today. It was the final nail in the coffin of the center of the Byzantine world, but in turn it would bring about the rise of the Ottoman Empire, an Islamic state. Constantinople was attacked from land and sea, but the land walls, known as the walls of Theodosius, had never been breached in their thousand-year history. In the same way that three hundred Spartans had defied the advancing armies of the Persian Empire, the citizens of Constantinople also stood heroically and defended their city against tyranny. It was both the Byzantine Greeks’ desire for freedom from enslavement, and the belief that God would miraculously save them from defeat, that led them to resist the Turks fiercely for almost two months. The Emperor did not trust Mehmet, and sent back his reply, “For it is not possible to take the city from the Romans and turn it over to the Turks. Were we to do this, along what road or in what place or Christian city could they settle where the inhabitants would not spit upon the Romans and revile them and mortify them? And not only Christians but also Turks and Jews would treat them with contempt.”9 The first Ambassadors were sent back unharmed. For a second time Constantine sent his ambassadors, laden with gifts, to request that Mehmet would leave the villages surrounding Rumeli Hisar unmolested. The ambassadors were sent away without audience. A week or two later when a third group of delegates was sent to get Mehmet’s word that building this castle would not herald an attack on the city, the Sultan had these ambassadors executed.10 This action was only the start of the violence to come. The majority of the western mercenaries were volunteers, mostly Venetian and Genoese, who assisted in the city’s defense. They were equipped with the following: handguns, crossbows, spears, and javelins. Most of them were seamen, so they were lightly armored; about 400 of the mercenaries were under the command of Giustiniani.16 Historians estimate that there were somewhere between 4,000 and 5,000 defenders, including the allies. This number has been put as high as 7,000 by some Byzantine scholars, but it is still debated. The Sultan planned to add a recent technological innovation to his arsenal that would alter the course of history and seal the city’s fate. Even though the walls of Constantinople stood unchallenged for centuries, siege warfare was to change with the use of the cannon. In 1452 a Hungarian weapons mercenary named Urban II offered to build an enormous cannon for Mehmet, “…Urban presented himself before the Sultan and offered to construct for him a cannon to blast the walls of Babylon itself.”18b Within a few months the largest cannon in the history of man was being created in the Sultan’s foundries. Urban’s cannon could hurl a 1,340-pound stone ball approximately one mile, and in addition he designed a second cannon which could hurl an 800-pound ball the same distance. 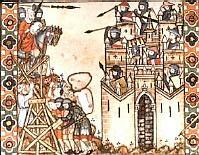 This technology had changed the art of siege warfare for over a hundred years prior to this event, and the Sultan’s new cannons would smash the very walls of Constantinople, thus allowing the Turks to be the first to enter through the land walls. Urban II had first approached the Emperor in the summer of 1452 about building this cannon for him, but he was turned down because the Empire lacked the funds for such a project. The siege began on April 2nd, but it was on April 6th the artillery bombardment began with the cannons firing 100-120 times a day until the siege was over.29 The strategic places Mehmet set the cannons were: near the palace of the Emperor, the Pigi Gate, and the Cressu gate; and then he also set four more cannons by the gate of San Romano, the weakest point of the whole city. It was not until April 18th that the first major assault took place on city. The Turkish fleet advanced towards the boom and came within a bowshot of the allied fleet. The Turks released a volley of cannon fire (small stones) and arrows with metal bolts, along with flaming arrows. After the initial salvo they approached the allied ships and attempted a standard boarding with grappling hooks and ladders. While the hooks were thrown up to scale the sides of the Venetian ships, attempts were made to slash the merchantmen’s anchor cable, but this attempt was thwarted by a hail of javelins, pikes, and spears hurled by ship’s defenders. Like sailors trying to storm a wall from below they faced a hail of missiles from the bow and stern platform above them, also from the crow’s nest. Volleys of gad — iron javelins with stabilizing fins — arrows and stones rained down on the enemy scrabbling at the sides of the ships, thus wounding and killing a great many of them and forcing the Turks into retreat.30 The failure of the first Ottoman assault brought great humiliation and anger to the Sultan, increasing his rage against its defenders. The Sultan needed to get his fleet inside the Golden Horn, but both the Venetian ships and the chain across the channel prevented this. On the April 22nd the Sultan created an ingenious plan to haul his ships over land and into the Golden Horn using rollers greased with animal fat, to pull them into the bay of Pera. “But no one would even had thought it possible that dogs such as these should drag these ships over the hills, bringing across as many as seventy into the harbor of Constantinople.”30b Nicolo Barbaro blames the Genoese for assisting the Turks in this venture. All the defenders feared that the Turks were now able to attack their fleet at night; since the enemy was now on both sides of the boom. The defenders made a failed attempt to burn the Turkish fleet before they could attack their ships. “On the twenty-fourth of April, Jacomo Coco the master of the galley of Trebizond took two ships and attempted to set fire to the Turkish fleet but this attempt failed because the Turks were prepared for this night attack.” So he (Jacomo) began to row at full speed, and headed for the fleet and when he was near the Turks opened fire” Caught by surprise his ship was sunk straight to the bottom with few survivors. “So the Turks won this victory, and we Christians were weeping bitterly and sorrowing greatly for the unfortunates who had drowned.”30c The Venetians bitterly accused their ancient trading rivals, the Genoese, of informing the Sultan about their planned attack on the Turkish fleet. Following a heavy bombardment of the gates of St. Romanus and Egri, an infantry assault on these sections of the walls began, but the defenders quickly threw the Turks back. The Ottomans focused their cannon assault on the St. Romanus gate and its flanking wall. By April 21st the walls had largely crumbled, creating wide breaches.31 The continuous bombardment of the walls throughout the day pulverized large sections of masonry and brought down a tower. This inspired a general fear amongst the defenders, because it was believed that Turkish turbans would soon be seen inside the city. Much of the wall was lost and this brought about great discouragement and a fear and amongst the populace that if the Turks had made the attack with only 10,000 men, at that point, the city would have been lost.32 Against great odds the Greeks were able to refortify the walls and averted the city’s takeover for another day. The Byzantines believed wholeheartedly that it was through the compassion of the Lord Jesus that the capture of the city was once again delayed. When they were finished, with their preparations, the Ottomans began blowing trumpets throughout their camp, along with sounding the castanets and tambourines, to announce that the Sultan would make a proclamation to his soldiers. Mehmet said to his men, “Children of Mahomet, be of good cheer. Tomorrow we shall have so much wealth that we shall be all of gold, and from the beards of Greeks we shall make leashes to tie up our dogs, and their wives and their sons shall be our slaves; so be of good cheer children of Mahomet, and be ready to die with a stout heart for the love of our Mahomet.”35 That night so many fires were lit in the Turkish camp that it appeared to the defenders as if the very walls were on fire, thus causing more panic in the city. The Sultan had already laid out his plans for the battle, which counted on the defenders becoming exhausted from the constant bombardment and skirmishes. Mehmet’s plans were to send three waves of soldiers, one after another, to exhaust the defenders, who had had little food or sleep. Exhausted and hungry, the defenders and their allies awaited the final assault, believing that God would save the city in the end. They had hopes that after the Turks broke through the walls an Angel of the Lord would appear by the column of Constantine and destroy the Turkish army, allowing the Greeks to chase them back to the borders of Persia. The attack began with the first wave of troops, the Christian contingent, who had the task of carrying the ladders to the wall, and these men were killed immediately. 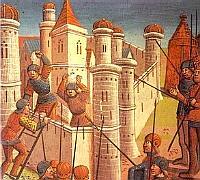 The defenders threw big stones at them and few escaped; anyone who approached the wall was killed. When the Turkish guards who stood behind them saw them retreating, they cut them to pieces with their scimitars and forced them to turn back to the walls, only to be killed by the defenders. The first wave ended quickly, but second group immediately began its vigorous attack. Mehmet’s first wave had worked by tiring the defenders further, and, since the Sultan had no regard for the lives of Christians, he easily sacrificed them without conscience. As soon as the Turks broke into the city they began to seize and enslave anyone who came their way. Anyone who resisted was slaughtered by the edge of the sword, and heaps of bodies covered the ground. “There were unprecedented events: all sorts of lamentations, countless rows of slaves consisting of noble ladies, virgins and nuns, who were being dragged by the Turks.46 In his zeal for Allah, Mehmet had ordered that the city, since it had resisted, be looted for the traditional three days according to Islamic law. But before the first day was up the Sultan brought in his police and put an end to the looting. The loss of the city for the Greeks meant not only an end of empire, but it also marked the start of almost four hundred years of captivity. For Mehmet it was the beginning of Ottoman rule, which would last until the 19th century. Under the rule of future Sultans the Ottoman Empire would continue conquering Christian lands, right up to the gates of Vienna in Austria. The Sultan, at the end of the conflict, while touring the Agia Sophia, was reported to have said the following. 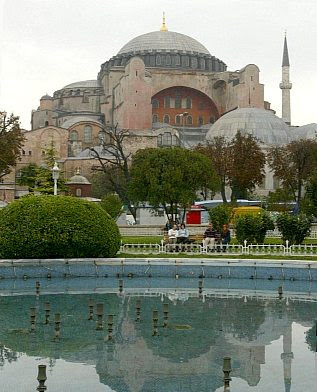 “The spider weaves the curtains in the palace of the Caesars; the owl calls the watches in the towers of Afrasiab.”48 From that point on the great city of Constantinople would be called Istanbul, capital of the Ottoman Empire and the Islamic Caliphate. Yes, it is correct that there were Venetians and Genoese and others from the West that provided information and assistance to the Ottoman attack on Constantinople. Consider that, and look at our situation today. There are many in NGOs, the media, and the US Government that provide information and assistance to the jihad against the West. Note that most VIPs in the West are already on the Muslim payroll in one form or another. They are bastards that should be hung by their feet and have their skin peeled off. Awesome post and very interesting, particularly to my family. My husband's cousin is a direct descendant of Constantinius Chlorus and his son Constantine the Great, founder of Constantinople. Incidently, in The Camp of the Saints the writer places descendants of the defenders of Constantinople in the frontline of the last pathetic battle for the West, when the voyage of the damned from the third world invades, without authorities lifting a finger, just like today - very eerie..